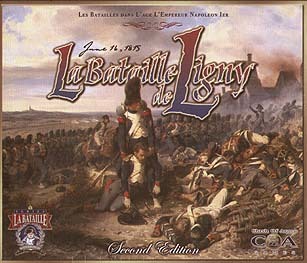 La Bataille de Ligny is the first in a series of four games detailing the climactic moments of Napoleon's last 100 Days as Emperor of France. This edition pits Napoleon against Blucher and his Prussian Army of the Lower Rhine. Even though he would outnumber the French in this battle, Blucher's troops are woefully unprepared for the struggle they are about to engage in. Napoleon, on the other hand, has culled the best of the troops France has to offer for this campaign. Ligny is this a classic match up of quality versus quantity. But regardless of which side you are playing, it takes skill to manage your forces, whether it be to overcome overwhelming odds, or to prevent what seems to be a numerical advantage from cascading into rout as the result of and unexpected reverse.